It was a want ad that set Donna Page ’61 on the unexpected path to her life’s work. The Green Bay native who began her career as an elementary school teacher is now world-renowned as a restorer of African art. Several rejections into her search, she saw a posting for an assistant at the L. Kahan Gallery of African Art. Its owner, Leonard Kahan, hired and mentored her, teaching her about the art of different African cultures. Aided by Kahan’s large library and sculpture collection, Donna learned to identify the origins of pieces in the collection. 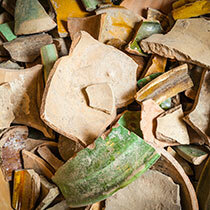 She also became proficient at conserving and restoring damaged wood and terracotta objects. Soon Page was supplementing her work at the gallery with a viable business restoring art for private clients. By 1987, Page was writing catalogue essays on African art exhibitions and curating exhibitions herself, becoming an authority on the subject. She co-authored and co-edited the book “Surfaces: Color, Substances and Ritual Applications on African Sculpture” (2009). Currently, she is working on a new book about African art, to be published in 2015. Page grew up on the west side of Green Bay, back when it was farmlands and fields. She says she was always interested in art and that her parents encouraged her creativity. Her undergraduate education “provided an entry into educational and professional endeavors, and created friendships that continue to this day,” she says. She was also a member of the first sorority on campus, Lambda Sigma Nu. After St. Norbert, Page taught elementary school for a short time before entering graduate school. At University of Wisconsin-Madison, she focused on printmaking and ceramics. M.F.A. in hand, Page went on to teach part-time at Western Illinois University and Illinois Wesleyan. She continued to teach after moving to Manhattan, work that included part-time stints in the art departments at Queensborough Community College in Bayside, N.Y., and Drew University in Madison, N.J. She also continued making art. In her loft, she painted and completed several drawings as well as wall installations, some of which exhibited in artist-run galleries in SoHo at the time when it was coming into its own as a booming art district. People collect different things: stamps, vinyl records, books and baseball cards, for example. 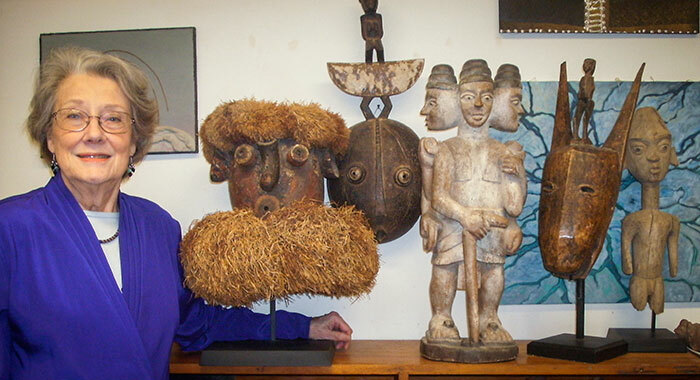 Donna Page ’61 collects pigments and pieces of clay from different regions of Africa. While most people collect for recreation, Donna’s collection has a professional purpose. Renowned for her work in African art restoration, she needs plenty of materials to refurbish the objects people send her. Besides her work with African wood sculpture, Donna specializes in performing conservation work on Asian and Native American terracotta. She also samples terracotta and wood sculpture for labs in both England and the United States to determine their age. Over the years, she has restored thousands of pieces, some as many as 2,000 years old.